Wood firing clay is an exciting endeavor and if you ever have a chance to participate in a wood firing, I say, “do it!” Wood firing clay results in beautiful surface treatments that range from melted rivulets of ash to delicate red-orange blushes, however not everyone has the time or energy (or kiln!) to devote to the wood-firing experience. P.S. For more electric wood ash recipes download your free copy of Wood Kiln Firing Techniques and Tips today! 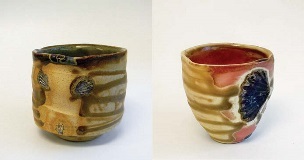 Unfortunately, you can’t realistically go about creating a sodium-vapor deposition atmosphere for flashing in an electric kiln or create a side draft to make those gorgeous wadding-directed flame patterns without destroying your elements and making the process horribly destructive and costly; however, you can easily load a “wood-ash glaze” into a spray gun and spray the patterns across your pottery (already mounted on wadding and shells) from one direction. The glaze will be easily blocked and directed by wadding, akin to results from a side-draft or anagama kiln. To match the palette of colors achieved from firing in a wood-fire kiln, red iron oxide can be added to the glaze. The recipe (shown below), uses a very small quantity of soda ash to promote flashing of the surface of Standard’s 182G clay body, which was recently labeled as vitrified at cone 6. Additionally, you may have noticed that this clay flashes with the use of sodium feldspars in oxidation. Some amount of sodium likely gasses out of the glaze during firing, creating a subtle orange blush halo on bare clay where the glaze line terminates. When it comes to being creative with your pottery, nothing tops being able to say “I created that glaze.” Through trial and error, getting the right blend of ingredients can set your ceramic pieces apart from the crowd. Greg Daly understands this and what you need to know to be successful in making glazes and he tells all in his book Developing Glazes. It is somewhat traditional to place ceramics on shells with wadding supports when firing in wood kilns, as very different pattern orientations are obtainable and the shells help catch any glaze that starts to drip in their direction, which is sometimes good and sometimes bad. Additionally, shells are mostly calcium carbonate with some salt impurities, or whiting. Upon being fired, even to cone 6, they will give off CO2 which will carry any volatilized sodium/salt content in the shell to the ceramic surface above it and create shell flashes in the work, as seen in figure 1. After being fired, the remaining shell will be CaO that will slowly pick up water vapor from the air, form Ca(OH)2, and crumble away. There are numerous parameters and variations to change here and develop your own style of electric “wood ash” ceramics. To warn fellow potters, unwashed wood ash is caustic and gloves are needed when working with it. Be mindful to avoid breathing the dust in; wearing a dust mask or properly fitted respirator is good practice here. Wood ash must be sieved to a manageable particle size. Test your wood ash with various fluxes, clays, and minimal amounts of colorants, as copper, iron, and manganese are already there in trace amounts that will contribute to color! As a hint, it is easy to add 2% increments of Gerstley borate to flux your glaze more and 2% increments of silica to reduce your flux. Ultimately, the chemical profile of a wood-fired pottery surface can be reproduced, even going beyond current methods and characteristics in color and color variety, on a realistic schedule, and in realistic parameters. Additionally, by using this recipe and not one of pure materials content for similar effects, you have begun to reduce your ceramic carbon footprint and both reduced/reused in the process. With roughly half of your glaze by weight consisting of waste wood-ash byproduct and no precious/expensive metals needed for producing color, material mining footprints can be reduced while creating surfaces that look far more difficult and time-consuming to make than they really are (Figure 2). Add:, Add*:, anagama, anagama kiln, ash, ash glaze, atmosphere, blend, body, calcium carbonate, carbon, ceramic, ceramic pieces, ceramic surface, ceramics, clay, clay body, color, colorants, colors, cone 6, creative, develop, developing glazes, download, draft, electric kiln, experience, feldspars, fire kiln, fired pottery, firing, firing clay, firing techniques, flashing, fluxes, form, gerstley borate, glaze, glazes, ingredients, iron, iron oxide, kiln, kiln firing, kiln firing techniques, manganese, materials, mounted, oxidation, palette, participate, particle size, pattern, patterns, pieces, potters, pottery, process, recipe, recipes, red iron oxide, reduce, results, salt, set, shells, silica, size, soda ash, surface, surface treatments, surfaces, techniques, time, tips, tops, traditional, variations, wadding, water, water vapor, whiting, wood, wood ash, wood ash glaze, wood fire, wood fire kiln, wood fired, wood fired pottery, wood firing, wood kiln, working.